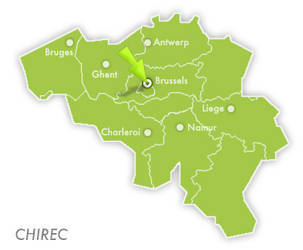 Edith Cavell Interregional Hospital Group, CHIREC, is a group of private hospitals, highly regarded both in Belgium and internationally for its hardworking teams of experienced specialists, all of whom are familiar with the very latest scientific developments. CHIREC is known for its excellence in orthopaedics, hand surgery, ophthalmology, gynaecology, obstetrics, medically assisted fertility treatment (IVF), bariatric surgery and oncology. The group also provides medical imaging, nuclear medicine and radiotherapy, using state-of-the-art medical equipment. CHIREC has acquired a new Somatom Definition Scanner (Parc Leopold Clinic), the first Dual-Source CT Scanner (2x64 slices) in Brussels and enabling high-precision diagnostics. Three CT Somatom Emotion Scanners and two magnetic-resonance "MR Symphony TIM 1.5 T" devices have also been installed at the Cavell and Braine Clinics. A latest-generation accelerator has also been ordered for the Radiotherapy Unit, and a second one is currently being upgraded. The hospitals are situated in the centre of Brussels close to the European Institutions and the NATO. It is a privileged environment close to the historical Centre, railway stations and the airport.